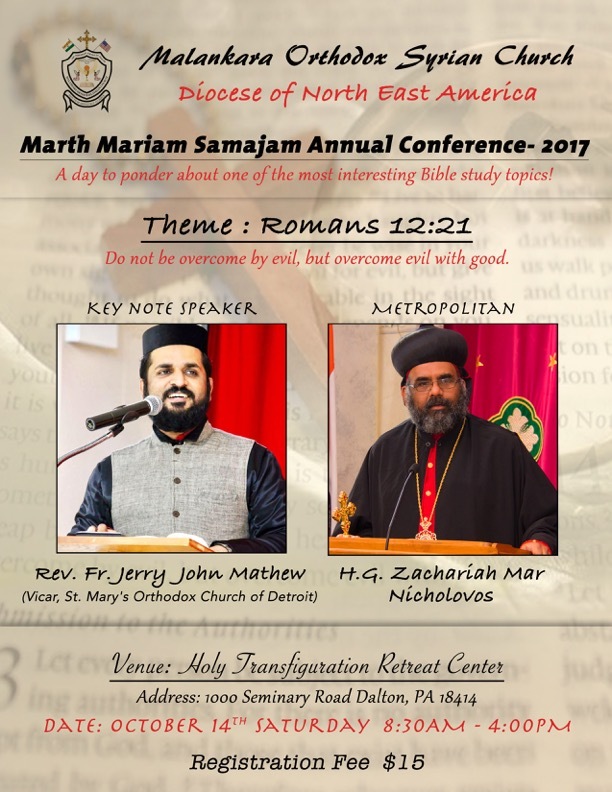 The Annual Conference of the Marth Mariam Vanitha Samajam of the Northeast American Diocese will be held at our Holy Transfiguration Retreat Center, located at 1000 Seminary Road, Dalton, Pennsylvania on Saturday, October 14, 2017 from 8:30AM to 4PM. The Reverend Father Jerry John Mathew will be the main speaker, and will present on the theme: “Do not be overcome by evil, but overcome evil with good” – Romans 12:21. All priests, deacons, and Marth Mariam Samajam members of our parishes are requested to attend and reap the benefits of this conference.